It's here! Beginning this month I am planning to read/reread Robert McCammon's works. I know that's a pretty huge schedule. I'm going to start with The Five this month because that is McCammon's latest release, and I have been waiting for fall to read it. Then I am going to go back through McCammon's backlist starting at the fifth book he published for a couple of reasons, but most notably because the ebooks will be available from Open Road Media if anyone wants to check them out. The last four books in my list are McCammon's first four published novels, and slated for future release by Subterranean Press. 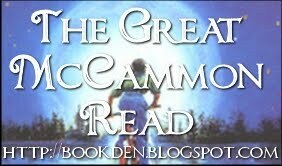 There are some exciting things in the works in regards to The Great McCammon Read. You know, other than getting to revisit a few of my favorite stories ever. If at anyone wants to join in at any level during the course of The Great McCammon Read, please jump in or let me know! If you review (or have reviewed) a McCammon book (anywhere) let me know, and I'll be sure to showcase it no matter what month. It doesn't have to follow my schedule. If you have a favorite McCammon and you want to do something official during the month it is scheduled - on your own blog or on Book Den - let me know! I haven't read anything by McCammon - I'll be sure to look out for a book. I haven't read any McCammon either... Looks good though!! Looking forward to your reviews, Jen! I have never read anything by him either. I am not that sure if I will be able to do every month. It will depend on how many of them my library has of his books and availability of course. The library how I do 80% of my reading. If I bought most of my book I would go broke..:) I am glad that you are doing this challenge. I have heard good things of him. I will probably be joining in December. That's awesome, Clint! I'm glad you are joining me. I'm a library user, too. Be sure to check OverDrive.com if you are an ebook reader. You can check out a lot of the McCammon ebooks through your library/OverDrive, too. I'm glad you guys are going to stay tuned. McCammon is definitely worth checking out. THis is great....McCammon is one of my FAVE authors...BOY'S LIFE is a classic in American lit as far as I am concerned. Thanks, Seeker. I couldn't agree with you more. "Swan Song" is the only one of his novels I have read twice, but there are soooo many that deserve another visit. Good luck, and enjoy! Robert McCammon is my favorite author and Boy's Life is my favorite book (I read it 3 times since 1992). Perhaps start with the Matthew Corbett series - Speaks the Nightbird or I've just started The Wolf's Hour which is proving to be amazing. I LOVE his voice. Boy's Life is the best book ever. It's fascinating.